Lead generation is a pillar of a profitable business. What your business needs are clear sources that will generate more leads in activities you already engage in. You need to leverage channels greater than your own and find ways to build relationships. 1. Quora is more than a glorified forum. Quora isn't your average forum. It lacks sarcastic comments and is jam packed with useful advice from professionals who want to help. Start by finding a question related to your niche and provide an in-depth answer with a supporting link to your blog. Within your article, provide a “bonus” opt-in offer in exchange for an email address. Examples of bonuses include downloadable checklists, cheat sheets, videos and mini courses. The goal is to turn highly targeted referral traffic into leads. Take your time to be thoughtful and fulfill the intent of the question first. You'll need to provide a thorough and practical solution from a logical standpoint. 2. 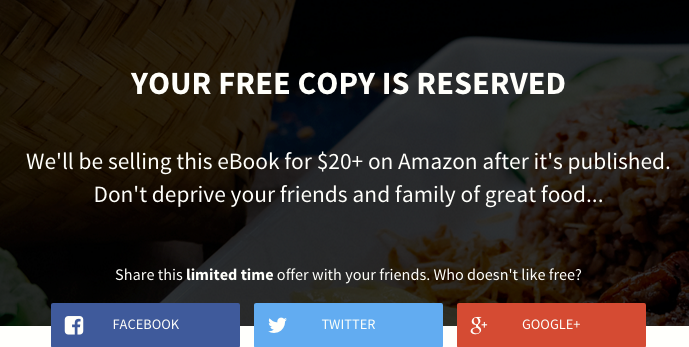 Growth hack with your thank you page. Thank you pages are commonly used to track conversion endpoints. The truth is, these "success" pages are more effective as relationship starters than enders. Use the momentum to ask new subscribers to take action. You might want to encourage them to share the offer they signed up for or complete a short survey to gain a deeper understanding of your audience. My team ran a growth campaign on a thank you page for a free recipe book. The goal was to get new subscribers to share the free ebook with their communities. The results showed a 2,355 percent increase in just a few days. 3. Use 404 pages to turn accidents into relationships. If you’ve ever changed your content-management system, URL structure or deleted old pages, you probably have some 404s hanging around. Groupon redirects their users to its deals. Coca-Cola offers a fresh start. Expansion Broadcast calls you nasty names and encourages you to contact the company. Renny Gleeson compares a 404 page to a broken relationship. When someone visits your website, you have the option to tell your visitor what you aren’t or to give them a reason to love you. 4. Take advantage of your archived posts. Hubspot’s Pamela Vaughan discovered that 76 percent of its monthly visitors came from “old” posts (at least one month old). The shocking fact is that 92 percent of their leads came from these archived articles. So what did Hubspot do? It optimized the past. Dig deep into your analytics and find posts that are generating the most traffic and leads for you. Go back in time and create captivating lead-generation offers that will determine your business’s future. 5. Link to your opt-in page from your email signature. How many emails do you send per day? Whatever the number is, start sending more. Noah Kagan, founder of AppSumo, sends a ton. He talks about his love for tacos, hot sauce, hot sauce on tacos and anything else you haven't seen in a conventional signature. It captures the reader’s attention, earns a click through and directs them to an email capture page. In his earlier years, he emailed everyone who commented on his website. The more emails he sent, the more leads he captured. Sending personalized emails to those already engaged builds relationships and your signature can help capture leads. 6. Social groups are lists of target audiences. Social groups are becoming a powerful source for generating qualified leads. Dmitry Dragilev from Kissmetrics does it on LinkedIn and I do it on Facebook. The game is simple. Nail your target audience and share something valuable with them. Before you start spamming boards, be intentional to acquaint yourself with group admins and frequent posters. They will help organically promote content they feel is valuable to the group. Do you notice a common element between these six hidden gems? Each strategy integrates seamlessly with your target audience’s daily life. The bottom line is that leads are all around you. Every interaction you have in and out of the office are opportunities to grow your business. Take time to make these easy tweaks in the way you already interact with people and the web. The leads will follow as you engage and provide value to those around you.